With an HP Mobile Broadband-enabled notebook and wireless carrier service, customers can check e-mail, browse the Internet and connect to corporate networks from anywhere within the coverage area. 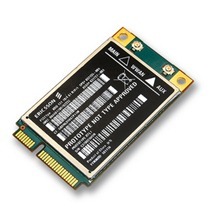 HP hs2350 HSPA+ Mobile Broadband MiniCard, Support for 3G networks, Standalone GPS enabled. This driver installer package contains the drivers for the Ericsson HP hs2350 Mobile Broadband modules. This package is available for supported notebook models that are running a supported operating system.